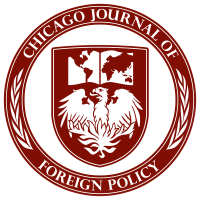 The Chicago Journal of Foreign Policy (CJFP) is a journal published by undergraduates at The University of Chicago that aims to provide a forum for problem-solving and analysis around international affairs. The journal, founded in 2012, features a collection of articles that reflect on historical, economic, political, and cultural developments within nations other than the United States, or explores relationships between the United States and the world. Each edition covers topics from regions around the world, and engages in ongoing discussions held on the international stage. Our biannual edition, published in the early winter and late spring, serves as a complement to our regularly updated online publication, featuring articles, op-eds, and blog posts produced and edited by our staff and by other students at our university. CJFP is a registered student organization (RSO) of UChicago. We accept contributions to our online issue anytime throughout the year, and accept contributions to our seasonal issue once in the late fall/early winter and once in the spring. For more about our submissions policy, please see our submissions guidelines page on this website.